We’ve been added to the Edmontunes playlist. Posted on April 20, 2014 by The Confusionaires!!! The fine people at Edmontunes (click here) have seen it fit to add 3 Fuzz Kings songs to their rotation. Very cool thing they’re doing over there! The website streams unsigned Edmonton music non-stop. Listen in! Nice change from the everyday commercial-driven radio! More Edmonton musicians should be getting in on this rare treat. 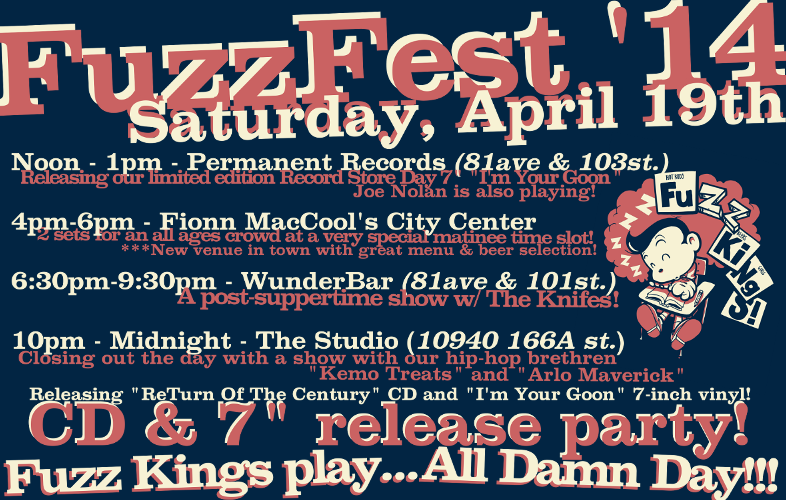 Record Store Day performance – This Saturday! Posted on April 15, 2014 by The Confusionaires!!! We’ll be nerd-bombing Permanent Records in Edmonton this Saturday for the Record Store Day festivities – and we’ll be pushing our own limited edition release out the door that day too. CJSR – The Shoebox – tonight! Posted on April 9, 2014 by The Confusionaires!!! We’ll be featured on CJSR’s Shoebox Radio Programme this evening -chit-chatting about the new album “ReTurn Of The Century” AS WELL as kicking off the World Radio Premiere of the limited edition 7-inch single “I’m Your Goon” which will be released on RECORD STORE DAY – April 19th @ Permanent Records in Edmonton! *** And remember – All your Fuzz Kings Merchandise needs can be met between shows, too! Check our online store at thefuzzkings.bandcamp.com. Whatever copies of “I’m Your Goon” 7-inch are left after record store day will be available online, too… but don’t leave it to chance! Record Store day 7-inch release and live in-store show! Posted on April 3, 2014 by The Confusionaires!!! Hey all, Record store day is coming up… and I’m sure you’re all saving your coins for the festivities that will ensue. Not sure if you heard but WE are releasing a BRAND NEW 7-INCH RECORD entitled “I’M YOUR GOON” that day, as well as performing at Permanent records in Edmonton, AB. It’s a big day all around, but make sure you get yourself a copy of this record! Posted on March 19, 2014 by The Confusionaires!!! WE’VE BEEN HEARING REPORTS OF RADIO PLAY of various songs from the latest “ReTurn Of The Century” – this is excellent news! We encourage you to call your local college/indie radio stations and request your favorite ditties in your local communities. LET’S MAKE THE PHONES RING!!! *** On March 31st, a commercial radio campaign for the single “Life Lessons” from the album “ReTurn Of The Century” will begin, which will only add to the number of stations you can call & request. Every little bit helps. We have some seriously awesome fans and recieve great support from the community… so thank you, and and thank you again in advance. Posted on March 7, 2014 by The Confusionaires!!! Now that the new full length album “ReTurn Of The Century” is avalable to the masses (get yours HERE!) you’re going to start seeing & hearing little bits & pieces of vital information regarding the upcoming limited edition Record Store Day release of “I’m Your Goon” – an aggressive surf rock & roll number that got left off of the “ReTurn Of The Century” album because of it’s overt aggression and punchiness. We felt that it didn’t really fit in the track list of the album since “ReTurn Of The Century” has such an up-beat feel throughout, and “I’m Your Goon” is more on the ‘dark side‘ of things. The flip side of the record has a tongue-in-cheek electric rockabilly number called “Guilty Conscience” that was recorded at Edmonton’s own Sound Extractor Studio by Stew Kirkwood. It was recorded in between the sessions for “Accentuate Everything” and the sessions for “ReTurn Of The Century” in late 2012. We love the way this song was recorded, and were saving it for a rainy day… And, well… It must be raining now. *** “I’m Your Goon / Guilty Conscience” will be available April 19th, 2014 and every day after that until they’re all gone. Get it while you can!